Hello there! There we are again! November! Christmas! Holidays! 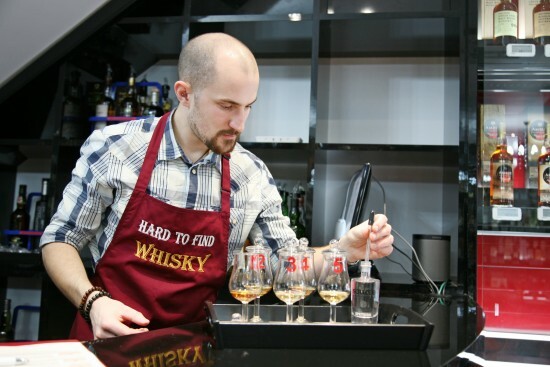 And delicious randomly sorted samples of whisky for a whole month. 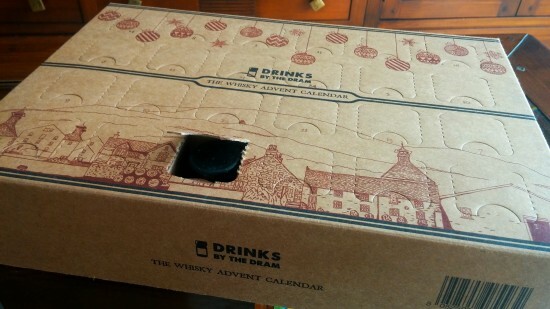 We are again at that time of the year, and always there we have a new incarnation of the Whisky Advent Calendar. This year is even more fantastic because we have the usual great whisky calendar, with samples of up to £600 whiskies but also we have several aditions. It has been really hard to choose one. I finally chose the standard whisky calendar because I haven’t tasted several of the whiskies inside like the Kilchoman Sanaig or the new Wolfburn Northland Single Malt and well because it has inside a sherried Macallan, a Kavalan, a 25 years old Glenfarclas… you can’t get it wrong. 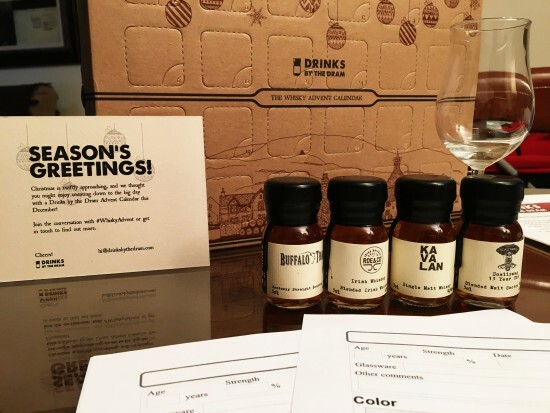 But between the new aditions to the range I really considered the premium whisky advent calendar and the expensive old whisky and very old whisky advent calendar. Well, not really, I can’t afford it and it is one of the problem with today’s whisky industry… I have no idea for whom they are creating this whisky… but surprisingly for me it is sold and it is even sold out!. 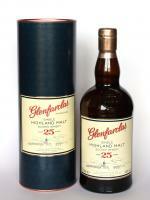 Just have a look at the bottles and it is a mouthwatering experience, expensive but intense and delicious. Unfortunately not for my pocket. I am not going to promise about tasting each of the samples each day because I won’t be able to do it ( Did I mention I am dad again for third time?! ) 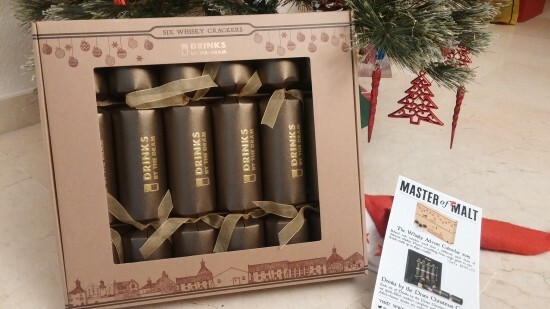 but I will do my best to keep you on the loop with this year whisky advent calendar. The first sample that I tasted was the iconic Buffalo Trace. Let’s review it! 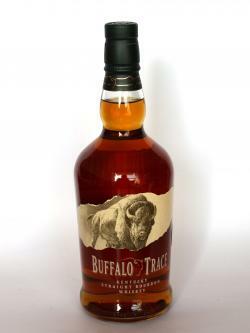 Winner of Malt Advocate's 'Distillery of the Year 2005' award, Buffalo Trace is a great bourbon at a very reasonable price. Jim Murray loves it. Nose (88): more than average. corn, flowers, spices, citrus, candies. 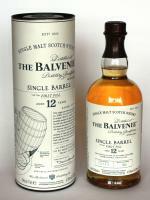 Balanced, sweet and with notes of age and wood. Quite interesting. Palate (88): smooth, oily. honey, flowers, citrus wood, corn. 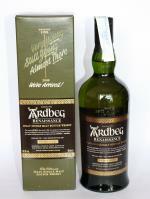 Sweet, lovely and still those notes of wood and age that show care and love for the product. Finish (88): longer than average. honey, citrus. So based on other whiskies I have already tasted I rate this Buffalo Trace with 88 points over 100. My opinion on Drinks by the dram’s Whisky Advent calendar is still the same, a fantastic idea, a great gift, a delicious experience and everything packed in little cristal bottles. Just great! And if you can afford the old & rare whisky calendar go and get it! Wooo! Just woo! Man, I have been almost two years without writing here, but this is going to change! I am back! Really back! Well… not so back! But I want to write more often about the stuff that I drink. Today I am tasting the new Mackmyra expression, their first wide release of a 10 years old whisky. 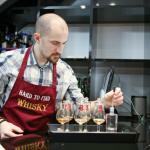 I have already tasted a few Mackmyra whiskies and to be fair I have always found them good stuff but not brilliant. Let’s taste this 10 years old. 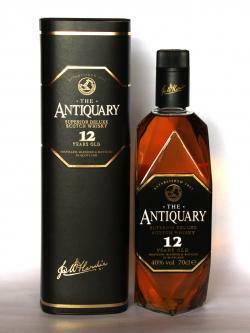 Aged in a combination of bourbon, oloroso-sherry and new American-oak casks for 10 years, this is rich yet elegant, spicy yet fruity, with notes of vanilla, raisin, anise, berries and wood spice. Nose (91): more than average. honey, vanilla, citrus, flowers, wood, candies. Palate (90): powerful, oily. honey, candies, spices, vanilla, citrus, wood, pepper. Finish (90): longer than average. honey, spices, wood. 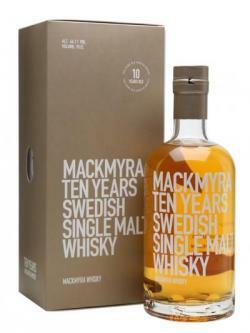 So based on other whiskies I have already tasted I rate this Mackmyra Ten Years Swedish Single Malt Whisky with 90 points over 100. A huge hit! I am looking forward to seeing this stuff in 10 years because it is hugely promising! You have just got a fan Mackmyra! Wooo! It has been almost a year since last time I wrote on the blog. I could write lots of excuses but to be fair… I got a bit exhausted of writing here and decided to do something else with my time. Unfortunately I became Youtuber. I run a youtube gaming channel and I am enjoying it a lot… but from time to time, I watch my whisky bottles and I feel a bit nostalgic. So when Drinks by The Dram told me about 2016 Calendar I couldn’t but jump and shout like a teenager. I am a bit fan of the idea behind this whisky advent calendar, for £149.99 you get a box full of samples of damn good whisky. Personally I love blind tastings but in case you want to know what are you drinking you can read the full list at their site. I won’t write spoilers this year… but I just opened the Day 1 window and found a Lost Distilleries Blend. Anyway, let’s taste this The Lost Distilleries Blend whisky. The Lost Distilleries Blend is a truly extraordinary whisky made exclusively with malts and grains from renowned, but sadly closed, Scottish distilleries. The surviving stock from these once great distilleries has become legendary in many cases, and is highly sought after by enthusiasts and cognoscenti. 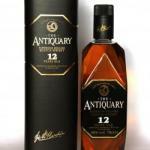 They are pieces of liquid history, lovingly crafted into this wonderfully balanced, multi-award-winning blended whisky. Nose (90): more than average. vanilla, honey, cinnamon, citrus, wood, grapes, butterscotch, tobacco, sandalwood. 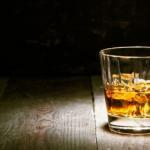 Palate (91): powerful, oily. honey, citrus, spices, pepper, vanilla, wood. Finish (89): longer than average. citrus, honey, spices. 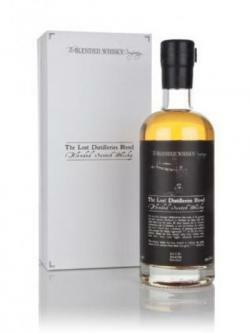 So based on other whiskies I have already tasted I rate this The Lost Distilleries Blend Batch 8 with 90 points over 100. I hope this little sip of whisky is the first of many to come. So, let’s crack them open! I haven’t been blogging as much as I would like lately mainly because… ummm… eeehhmm…. let me find an excuse :), I still have to write about a few Ardbeg whiskies I have been tasting and about the Laphroaig Live whiskies ( pretty awesome stuff there that nor me nor you will be able to buy )… but well, from time to time you can give yourself a treat like this amazing Whisky Advent Calendar. 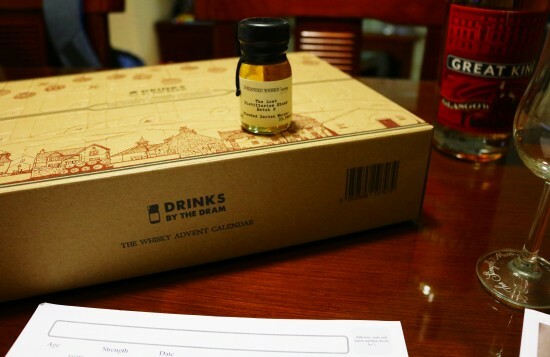 Drinks by the Dram Whisky Advent Calendar 2015 is packed with 24 whiskies ranging from amazing to just damn good amazing stuff… I was surprised last year to find only two or three whiskies that they weren’t top stuff… and I am quite happy to see that this year selection is perhaps even better. Here is the list, judge by yourself. Ouch! It is that time of the year again, Summer is just ending, leaves start falling form trees, shorter days, more cold days, back to work after a great holidays… buuuut at least as each year we have a Laphroaig LIVE event. This year event will take place in Islay, September 24th at 20:00 (UK Time). Previous shows have brought you the flavours of Spain, Germany, America and even Australia but this year will be tasting 4 very special expressions. The one off� Laphroaig 15 YO � The official 200th Expression, Laphroaig Cairdeas 2015, Laphroaig 21 YO � Created for the Friends of Laphroaigs 21st Birthday and a unique Laphroaig 32 YO 100% sherry matured- A very rare, special expression. I received about a month ago two new Crown Royal whiskeys and I haven’t have time to properly write a review till now. I really enjoy the sweet delicate profile of Crown Royal whiskeys so I was pretty excited when I got two new additions: a rye whiskey and a single cask higher strength whiskey. 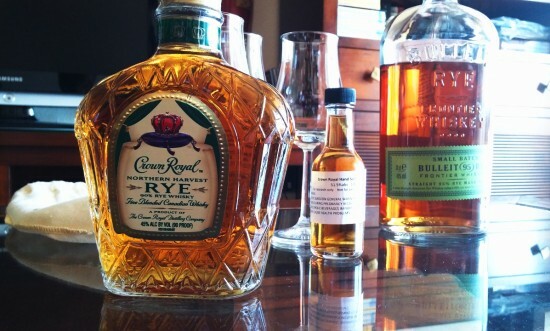 The style of Crown Royal is closer to Scotch whisky than to their American cousins: Bourbon and Rye whiskeys, so for me it is a pretty interesting experiement how close they can be to a real rye whiskey without forgetting about their own heritage. So let’s review the first whiskey. Hard To Find Whisky is located in the Jewellery Quarter, one of Birmingham’s most historic areas. The frontage exudes style and luxury with a modern glass door and marble steps leading in. Once inside, it’s hard not to be impressed. 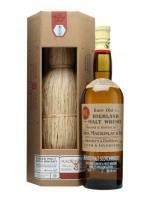 There are over 22 units displaying 3,500 bottles, from entry level Grants’ blend to their jewel in the crown bottling, the Macallan 1928 50 Year Old, on sale at �35,000. This is very clearly a shop for whisky enthusiasts. All the ultra rare whiskies are displayed in glass cabinets, lit with beautiful led lights. 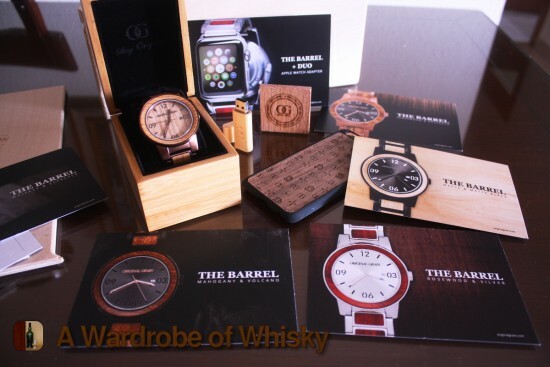 This really brings the colour of the whiskies to life and displays them in their best way possible.